Do I need a painter? In wanting to change the look of your house, there is no reason why you need to show off to anybody. The tasks involved in the painting are always very stressful to the body. The stretching and lifting, bending and crawling are tough on your body especially if you are not accustomed to these kinds of tasks. There cases where you need to balance on a ladder or a narrow surface in order to reach a corner, but if you’re the dizzy head types then you need to reconsider. In any home painting project, there is call for strict preparation of the surfaces before any paint is applied. This involves scraping and sanding as well as replacement of missing caulk and rotted wood. This is a very important part of in the painting job process when you mess this up you mess up the painting project. One reason is after painting you start seeing some places lighter than others while others have curves and some places with humps. 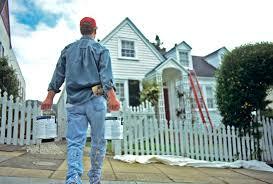 House Painting is a time-consuming process that requires thorough preparation. If your idea is to carry out a bigger scope of work in a specified amount of time, setting you time right is a major requirement. Most homeowners have full-time jobs and offer little or no spare time to carry out the painting job. At times the weather too is an issue, it might rain day in and day out at other time too much snow. At other times it might be an event that you are preparing for, it is complicated to prepare one in such a situation. With all these issues at hand, allow somebody else to do the work for you. Somebody will get a job and get paid because of your decision and what probably would take weeks for your will only consume a couple of days for the contractor. It does no harm to hire a professional painter to do for you some painting, some little issues that your beginner’s eye will not see, will not be able to escape the professional eye of the contractor. Take your time so that you can research and be able to identify and hire a house painter who will do for you a good job you will be proud of. Foothills Painting is a professional painting company that provides interior and exterior painting. If you would like more information contact us at https://foothillspaintinglongmont.com or check out our Google Plus Page for painters Longmont.